Chippies are a common sight in the Antwerp street scene. Antwerp has a rich chips/French fries culture and has so many chip shops that it’s hard to see the wood for the trees. In fact, did you know that the Belgian chip-shop culture belongs to the country’s intangible culture heritage? Students are well catered for in Antwerp. You will find de Smulpaep in the university district, a chip shop where students can queue up for a fried snack until late. Surprisingly, there is no Belgian chef behind the frying pans, but a French chip shop manager. So they are literally 'French fries'! 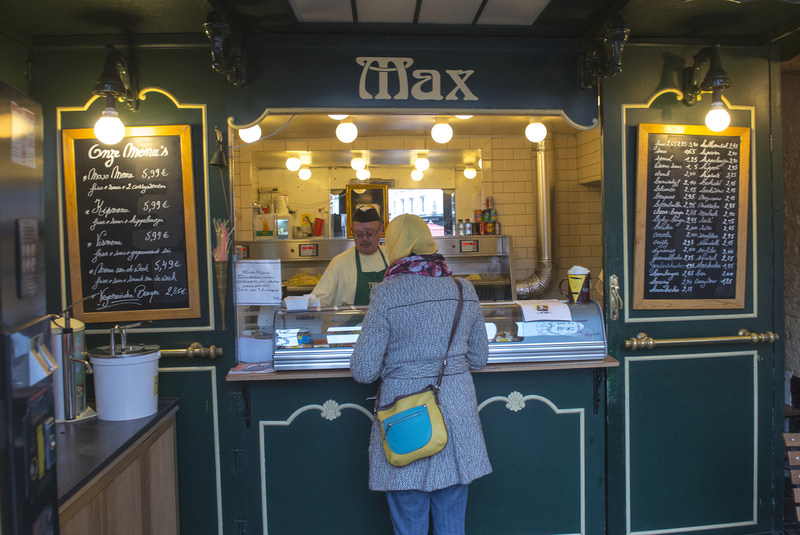 Fritkot Max may well be the most famous, and oldest, chip shop on this list. Here you can enjoy delicious chips in an old-fashioned, authentic cone. If you want to soak up some culture while eating, then why not go upstairs to visit the chip-shop museum? In this small museum, you can find more information about the Flemish chip-shop culture. Frituur No.1 has long been a familiar concept in Antwerp. This chip shop has been open day and night since 1980. Just a few steps from the Grand Place, this chip shop is also a real attraction among tourists. Don’t forget to try the pot roast gravy (stoofvleessaus)! Frituur Lescluze describes itself as "Berchem’s hidden gem”. For good chips, you sometimes need to walk the extra mile and move to another part of Antwerp. We promise you it'll be worth it. Even Antwerp’s star restaurant The Jane has thanked Lescluze for the tasty chips. If you rate the atmosphere just as important as the chips themselves, then Frituur Linkeroever is the place to be. With views of the Antwerp skyline, you can enjoy traditional chips from a real chip shop. When you exit the underpass, you will be met with the smell of freshly fried chips. The latest kid on the block is Frites Atelier. This luxury chip shop was created by Chef Sergio Herman. With chip shops in Utrecht and The Hague already up and running, this chip shop is part of a small chain with a Dutch touch. The chip shop in Antwerp is the first Belgian establishment. Here, you will not just eat any old chips, but luxury chips with a slightly higher price tag.